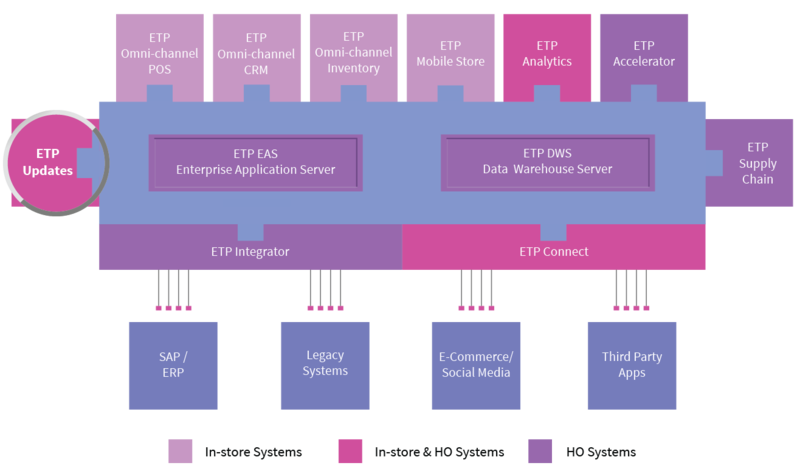 ETP Updates is a retail software management application which resides both centrally at the H.O. level and individual stores. Based on a well-defined process, it installs, updates and implements patches, fixes and most importantly, customizations and enhancements, seamlessly and silently across stores. The updates of the store systems can be planned in a sequential or parallel manner depending upon brand, geography, format, infrastructure and other considerations. All modifications ordered from ETP can also be rolled out in an automated manner as a background process. An intuitive dashboard at the head office provides the status of the updates across all the stores for related teams to remain well-informed. This helps retailers reduce the cost of employing a skilled task-force to administer the updates manually at every location. Aside from saving time, the reduced human intervention helps maintain the system integrity, security and stability. The retail software management application is specifically designed for companies that can centrally configure and control the download manager which auto-detects, downloads and installs updates. It also helps update the UAT completion status and release updates to the production environment. It creates and maintains the updates’ lifecycle for the new retail stores.